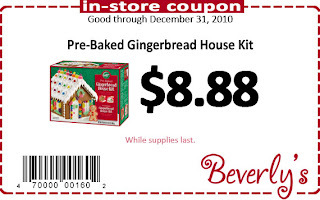 Make your next home decor project an edible one with our Pre-Baked Gingerbread House Kits, now only $8.88 when you print out our December in-store coupon. These are so much fun to make with your kids or during holiday parties with friends. Discount coupons can be your best bet during shopping online. Thanks for great tips. Good to find out such detailed information and i would certainly save some bucks using discount coupons as well. Discount coupons really help to have a less impact on your pocket. Thanks a lot for this information. It will really help me to save a lot.